Attributed to Italian food chefs, this food item is made as boneless breast of turkey basted with a variety of succulent seasonings and spices. Porchetta (renamed in the U.S. as porketta) is a version of a highly seasoned, Italian slow cooked pork roast that has been remade into a boneless pork loin seasoned with a dry rub. 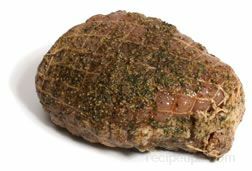 Similar in preparation, Turketta is a boneless piece or pieces of turkey rubbed and coated with seasonings that may include dill seed, fennel seed, oregano, pepper, and garlic, as well as other seasonings. Precooked versions of Turketta are also available which prepare the meat as thin slices for use in sandwiches or for use on appetizer trays. Well seasoned and salty in flavor, the meat from the Turketta is rich in taste.